if you are anything like me your craft area has grown to a level you no longer know how to contain. i am guilty of letting my work areas get incredibly messy and even letting your crafts travel and take over other parts of the house. 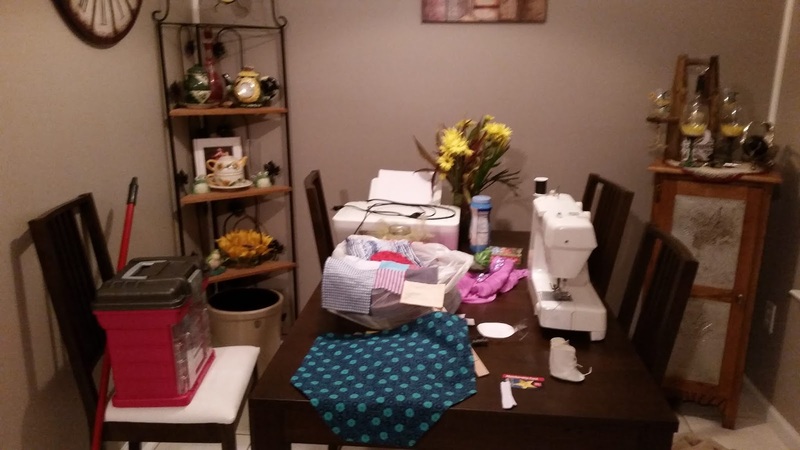 this is my kitchen table that until recently was a big center for my crafts even though i do have a designated craft area in the basement. in an effort to try to keep myself organized i have started using totes to hold my fabric scraps and my finished projects since half the time i don't know what to do with my projects once ive finished with them. i also keep 2 stacking drawers and one that's one wheels i try to keep everything that has to do with each main craft that i do. one container i keep all of my crochet hooks and yarn. another i keep everything that i have to use for my embroidery. and the one i keep closest to me i keep all my buttons trims and bias tape for my sewing. i use a lot of containers to help keep all of my stuff together and tidy but when in a creative mood its very hard to keep my work space clean.